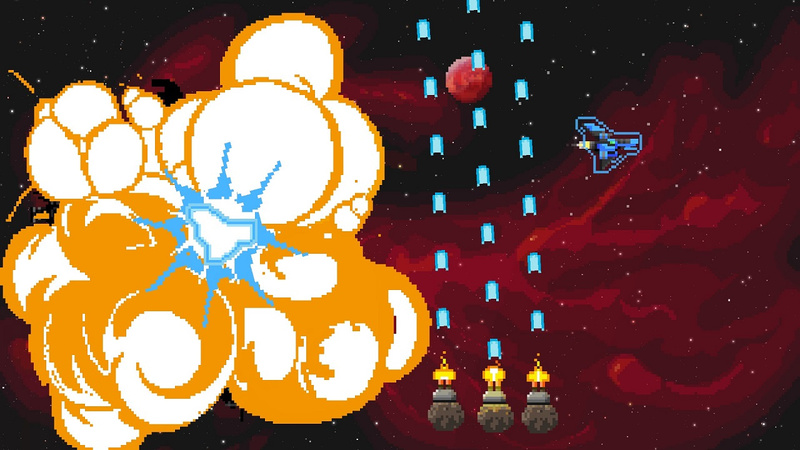 In October of 2015, a French studio called Pixelnest released a space shooter arcade game called Steredenn, which blended classic shmup action with roguelike elements. The final product received high praise across the board, but Pixelnest wasn’t content to simply stop there. Over the last year, the studio has been working on a whole slew of expansion content for the game, and the result of this is Steredenn: Binary Stars, which has now come to the Switch eShop. 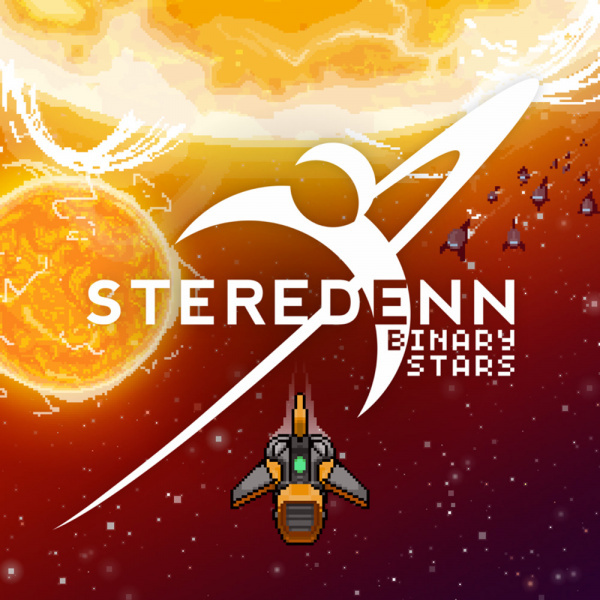 While it may not appeal to everyone, Steredenn: Binary Stars absolutely nails its aspirations, perfectly marrying two high-difficulty genres to form a punishing and satisfying experience that’ll keep you coming back for quite a while. 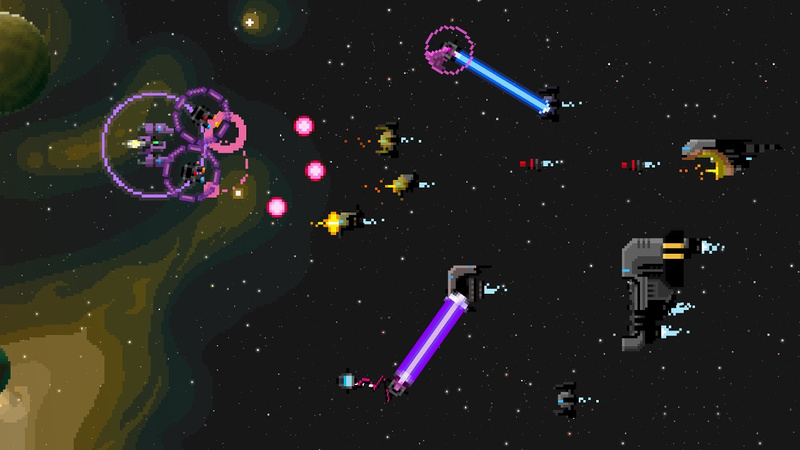 In terms of gameplay, Steredenn doesn’t aim to reinvent the wheel here, instead focusing on providing a highly polished version of that shmup style gameplay that’s been around since the glory days of arcades. You blow through dozens of cannon fodder enemies to reach a boss that positively fills the screen with bullets, and you’re given an upgrade if you can manage to win the fight. If you can somehow clear the final boss, the game loops back on itself and you do it all over again with all your upgrades until you inevitably lose. So far, so familiar, but the real hook of the gameplay comes in how Steredenn iterates on this tried and true formula. There are five ships to choose from and each feels suitably distinct from the next. Not only do the ships have varying power, speed, and health, but each has a special ability that’s always on cooldown which can dramatically help turn the tide in your favor. 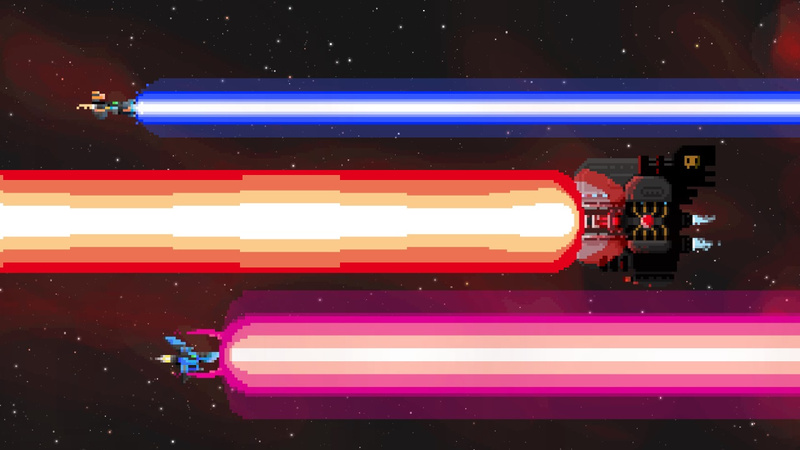 One ship has a rocket barrage that nearly clears the screen of enemies, while another has a teleportation attack that can double as a dodge if you’re particularly nimble. Though you’ll doubtless find a ship that you make your ‘main’, it can be fun to do run-throughs with the other ones to mix things up; the full lineup is certainly appreciated. Each ship can hold two weapons at a time, and you get new ones by blowing up a certain carrier ship that pops up a couple times in each stage. There’s a total of 49 different weapons on offer, and the carrier randomly drops one or two when you blow it up, which leads to some very diverse and interesting runs. One run might see you stuck with deployable flamethrower robots and a piercing laser cannon while another might give you a close-range iron jaw and a shield. The nice part about this diversity is that it not only forces you to try a wide variety of playstyles, but it also passively teaches you how to be an adaptable fighter. The odds are that you won’t get your favorite gun, but Steredenn is all about making do with what you’re given. This further extends to the upgrades you get after beating a boss character, where five options are given to you each time and you can only pick one. These can give you things like buffs for certain weapon types or passive shield generation when you don’t fire, and once again, the total list of upgrades is quite deep. Mixing this system with the already random nature of the gun distribution means that you can play the game hundreds of times over and never quite have the same experience, and this is only further buttressed by the procedural generation for enemy waves. It’s remarkable how Steredenn manages to make such a simple game feel significantly deeper in this way. 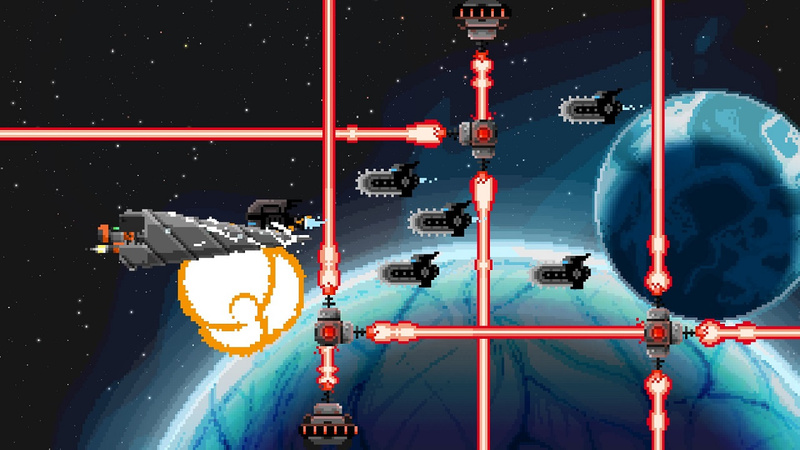 When it comes to difficulty, Steredenn is just about as hard as you’d expect of the shmup genre; it’s no small feat to actually make it to the final boss. That being said, it’s also an entirely fair game, almost Dark Souls-like in how it punishes mistakes, but rewards patience and strategy. If you don’t put thought into the kind of build you’re going for, or you don’t pay attention to the waves of bullets and ships covering the screen, death will be swift and you’ll be sent back to square one until you can do it right. It’s through the constant attempts that you build up a working knowledge of the mechanics, which makes every victory feel like it’s rightfully earned. In addition to the core game mode, there’s three side modes that help to pad out the experience a bit. Daily Run gives you one try to get as far as you can with a standardized ship and loadout, with your score then being posted to a global leaderboard. Similarly, Boss Rush is another competitive mode with a weekly lineup of bosses that you can marathon as many times as you want, though you’re still tied to the same ships and weapons each time. Finally, Arena lets you separately take on each boss you’ve encountered with whatever ships or weapons you want, with the goal being to beat them as fast as possible. Though none of these modes really deviate from the core game, they act as a nice supplement for when you want a more specific challenge. And for those of you that are looking for a more social experience, local co-op is also featured. Every control set up on Switch is supported, and your friend has access to all the guns, upgrades, and ships that you do. Co-op mode is about what you would expect then, as you challenge the main mode with a pal, but it’s notably harder in some ways. Enemy health seems to be bumped up a bit to match the doubled firepower and you share a health bar with your teammate, so this certainly qualifies as the kind of game you’ll want to tackle with a friend who’s experienced in playing these types of games. It can be great fun, however, mixing different ships and abilities to initiate battle strategies which you otherwise wouldn’t be able to pursue when going solo, and it’s quite reassuring to have somebody watching your back. Though the gameplay is stellar enough, it’s arguably surpassed by Steredenn’s fantastic presentation. Each level is decorated by gorgeous pixel art of cosmic wonders, and the sheer variety of colorful backdrops on offer give environments a lot of visual appeal and wonder. Though the sprites of ships and enemies aren’t perhaps nearly as imaginative, the artwork is nonetheless crisp and defined, demonstrating great mastery of detail. All of this is matched by a rather bizarre, but surprisingly fitting heavy metal soundtrack that keeps the tempo high. One would expect chiptune when looking at this game, but the metal music helps to make Steredenn stand out that much more and gives it a special kind of charm. One last point that bears mentioning is that we did experience a few bizarre glitches here and there. At one point, the music cuts out completely, and there were a few times that the game completely crashes. Hopefully this will be addressed by the developers in an upcoming patch; it doesn’t impact the game in a major way, but you may run into some hiccups like this every now and again. 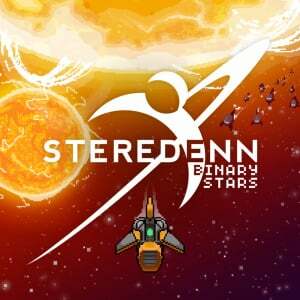 All told, Steredenn: Binary Stars is a fantastic release that does a great job of providing an experience that feels simultaneously classic and modern. It’s high difficulty, rewarding gameplay, endless variety, and beautiful presentation make this an essential buy for any fans of the genre, and a high recommendation for those who aren’t. If you’re looking for a tightly made arcade game that can be played both in short bursts and for hours on end, look no further than this. Kudos to you Mitch for the Space Odyssey reference in the sub-title. Have not been a day since release I haven't played this one. Absolutely stunning. Thanks to you and @Oorwullie for talking about this game. Never heard of it before but it sounds very fun and well done. Yep, a well deserved 9/10.This game is absolutely outstanding. Seriously addictive, beautiful to look at, incredible to listen to and insanely tough. As modern shooters go, it doesn't get any better than this beauty. Why can't I hold all these eShop games?!?! There's so many shooters on Switch I've almost stopped paying attention...but based on this and everyone's comments, I might just have to try it. @sinalefa Speaking of never hearing about a game...I wonder if Nintendolife forgot to review Never Stop Sneakin'? I was interested in seeing their review. Great review overall, though the next time I read a review of a hard game in which Dark Souls is mentioned I’m probably gonna puke. Man. This is being bought pronto - but ... I just (finally) got Adiom Verge , loving it so far and Old Mans Journey - slow but gently pleasing as promised. 1945 II needs to be got. As does Splatoon 2 and DOOM and aaaaaaarghh! @Giygas_95 Now that you mention it I was wondering what Nintendolife had to say on Never Stop Sneakin'. From what I've read it lacks variety and apparently you can play most of the game simply by moving the control stick or use the touch screen, doesn't seem to have much complexity. 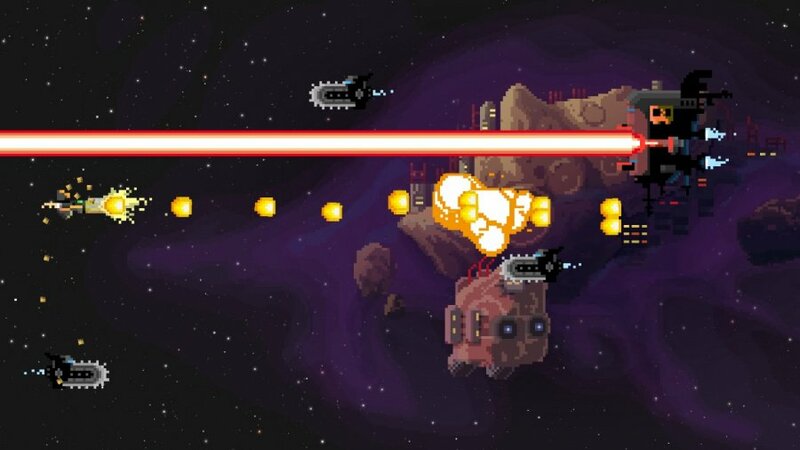 I was just playing it there and as I was fighting the 3rd boss the Tardis flew past me. I'm not sure if it means anything or if it's just for show but man that was cool surprise. @clvr Usually I feel the same way, but I feel the comparison is justified here. The way the game teaches you things reminded me of Dark Souls in many ways. Good to read this game has been received so well. It's a tough challenge for sure but as stated above, it really does capture that classic horizontal scrolling shooter magic. Certainly a one more goer! Sounds like for fans of these types of games this game is going to please. But I don't think this one is for me. Have fun! I got this game and I love it. 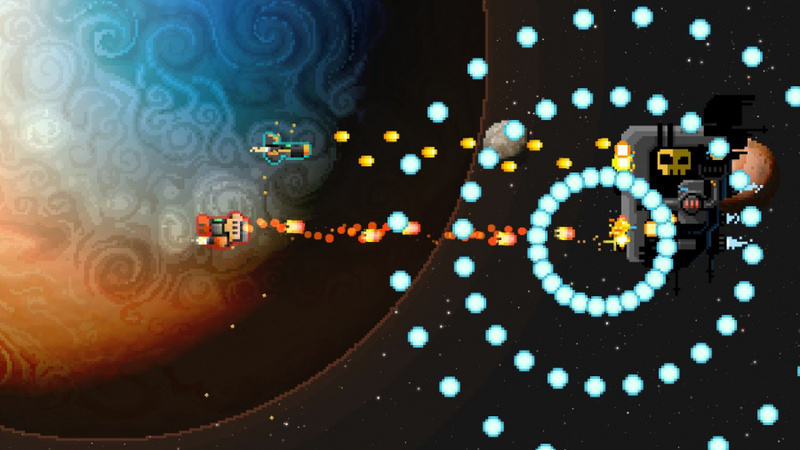 Perfect blend of pixel art and classic shoot-em-up gaming with a modern twist. I've had the original on Steam for some time. It's one of my favorite "come back and play a few rounds periodically" games. Real tempted to pick it up on Switch. I liked the sound of everything in this review... apart from the lack of chip tune. Still, this could become my first Switch shmup. There's a lot of praising reviews for this, but I think this is the first one I read that mentions technical issues. Crashing does not seem like something that should be omitted. @RetroGamerAndrew @Daftbomb You guys are welcome to add me as well, I play just about every day. Love this game, the switch has so many great games I can't keep up.. I generally hate roguelike games but marrying it with a shmup makes me actually want to try it...I'll add this one to the list. Dev here (Damien from Pixelnest). About the crashes and bugs: we are aware of the issue and submitted a patch to Nintendo today. A big patch with fixes and some surprises. We'll keep you updated when it goes live, I hope as soon as possible obviously. @valryon Looking forward to it! You guys did a great job with this! @valryon Good to hear! Amazing game btw! Another bug I've run into - sometimes the controller vibrate will be stuck on and the only fix I've found is to restart the entire game. It's a really unique game. Kind of weird in that the bosses are much easier than the levels. You can memorize the small number of boss patterns and deal with them. But every level throws random enemies at you in random waves, so you can't memorize - you just have to get extremely good. @16bitdave Took this opportunity to pick it up. What a fantastic game. @jwfurness nice yeah its great! Super rare game release - yes please. Flip game holder for switch also delivered this month.